This article is about a type of combat diver. For other uses, see Frogman (disambiguation). A frogman is someone who is trained in scuba diving or swimming underwater in a tactical capacity that includes police or military work. Such personnel are also known by the more formal names of combat diver, combatant diver, or combat swimmer. The word frogman first arose in the stage name The Fearless Frogman of Paul Boyton in the 1870s and later was claimed by John Spence, an enlisted member of the U.S. Navy, to have been applied to him while he was training in a green waterproof suit. The term frogman is occasionally used to refer to a civilian scuba diver. Some sport diving clubs include the word Frogmen in their names. The preferred term by scuba users is diver, but the frogman epithet persists in informal usage by non-divers, especially in the media and often referring to professional scuba divers, such as in a police diving role. 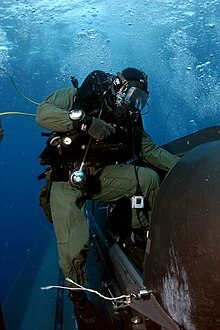 In the U.S. military and intelligence community, divers trained in scuba or CCUBA who deploy for tactical assault missions are called "combat divers". This term is used to refer to the Navy SEALs/Naval Special Warfare, operatives of the CIA's Special Activities Division, elements of Marine Recon, Special Amphibious Reconnaissance Corpmen, Army Ranger Regimental Reconnaissance Company members, Army Special Forces divers, Air Force Pararescue, Air Force Combat Controllers, U.S. Coast Guard Helicopter Rescue Swimmers, United States Naval Search and Rescue Swimmers, United States Air Force Special Operations Weather Technicians, and the Navy Explosive Ordnance Disposal (EOD) units. In Britain, police divers have often been called "police frogmen". Some countries' tactical diver organizations include a translation of the word frogman in their official names, e.g., Denmark's Frømandskorpset; others call themselves "combat divers" or similar. Others call themselves by indefinite names such as "special group 13" and "special operations unit". Many nations and some irregular armed groups deploy or have deployed combat frogmen. Merriam-Webster defines a frogman as a person equipped for extended periods of underwater swimming, and particularly for military reconnaissance and demolition. The Oxford English Dictionary states: "A person who swims under water wearing a rubber suit, flippers, and an oxygen supply." The Encyclopædia Britannica provides a narrower definition for Frogman, Naval personnel (which suggests the possibility of other meanings) as an unarmed member of a US Navy underwater demolition team which reconnoitred beach landing areas, observed enemy positions near the shore, and detected and cleared dangerous underwater obstructions. The Cambridge Dictionary defines a frogman as: "someone who swims or works underwater for a long time wearing breathing equipment, flippers, and usually a rubber suit". The Macmillan Dictionary definition is identical for British and American English as: "someone who does police or military work under water using special clothes and equipment". Collins English Dictionary gives "a swimmer equipped with a rubber suit, flippers, and breathing equipment for working underwater" as the British English definition, and "a person trained and equipped, as with a rubber suit and scuba apparatus, for underwater demolition, exploration, etc." as an American definition, citing Webster’s New World College Dictionary, 4th Edition. Copyright 2010 by Houghton Mifflin Harcourt. They also indicate a trend of steadily decreasing usage from the mid 20th century to 2008, and the word may be obsolescent. The Dictionary of American Slang reports that colloquial meanings include a scuba diver, particularly a professional or military diver of WWII. Special mission work divers (called Clearance Divers in the British Royal Navy and Royal Australian Navy), who do general work underwater. Work divers who are trained in defusing mines and removing other explosives underwater. These groups may overlap, and the same men may serve as assault divers and work divers, such as the Australian Clearance Diving Branch (RAN). Amphibious assault: stealthy deployment of land or boarding forces. The vast majority of combat swimmer missions are simply to get "from here to there" and arrive suitably equipped and in sufficient physical condition to fight on arrival. The deployment of tactical forces using the arrival by water to assault land targets, oil platforms, or surface ship targets (as in boardings for seizure of evidence) is a major driver behind the equipping and training of combat swimmers. The purposes are many, but include feint and deception, counter-drug, law enforcement, counter-terrorism, and counter-proliferation missions. Sabotage: This includes putting limpet mines on ships. Clandestine surveying: Surveying a beach before a troop landing, or other forms of unauthorized underwater surveying in denied waters. Clandestine fitting of monitoring devices on submarine communications cables in enemy waters. Investigating unidentified divers, or a sonar echo that may be unidentified divers. Diving sea-police work may be included here. See anti-frogman techniques. Checking ships, boats, structures, and harbors for limpet mines and other sabotage; and ordinary routine maintenance in war conditions. If the inspection divers during this find attacking frogmen laying mines, this category may merge into the previous category. Underwater mine clearance and bomb disposal. Typically, a frogman with closed circuit oxygen rebreathing equipment will stay within a depth limit of 20 feet (6.1 m) with limited deeper excursions to a maximum of 50 feet (15 m) because of the risk of seizure due to acute oxygen toxicity. The use of nitrox or mixed gas rebreathers can extend this depth range considerably, but this may be beyond the scope of operations, depending on the unit. Keeping out of sight (e.g., underwater) when approaching the target. Carrying out an action of which the enemy may become aware, but whose perpetrator cannot easily be discovered or apprehended. Covert action often involves military force which cannot be hidden once it has happened. Stealth on approach, and frequently on departure, may be used. Anti-frogman techniques are security methods developed to protect watercraft, ports and installations, and other sensitive resources both in or nearby vulnerable waterways from potential threats or intrusions by frogmen. Frogmen on clandestine operations use rebreathers, as the bubbles released by open-circuit scuba would reveal them to surface lookouts and make a noise which hydrophones could easily detect. In ancient Roman and Greek times, etc., there were instances of men swimming or diving for combat, sometimes using a hollow plant stem or a long bone as a snorkel. Diving with snorkel is mentioned by Aristotle (4th century BC). The earliest descriptions of frogmen in war are found in Thukydides' History of the Peloponnesian War. The first instance was in 425 BC, when the Athenian fleet besieged the Spartans on the small island of Sphacteria. The Spartans managed to get supplies from the mainland by underwater swimmers towing submerged sacks with supplies. In another incident of the same war, in 415 BC, the Athenians used combat divers in the port of Syracuse, Sicily. The Syracuseans had planted vertical wooden poles in the bottom around their port, to prevent the Athenian triremes from entering. The poles were submerged, not visible above the sea level. The Athenians used various means to cut these obstacles, including divers with saws. It is believed that the underwater sawing required snorkels for breathing and diving weights to keep the divers stable. The Hungarian Chronicon Pictum claims that Henry III's 1052 invasion of Hungary was defeated by a skillful diver who sabotaged Henry's supply fleet. The unexpected sinking of the ships is confirmed by German chronicles. Italy started World War II with a commando frogman force already trained. Britain, Germany, the United States, and the Soviet Union started commando frogman forces during World War II. The word frogman appeared first in the stage name The Fearless Frogman of Paul Boyton, who since the 1870s broke records in long distance swimming to demonstrate a new invented rubber immersion suit, with an inflated hood shaped like a frog. As a stunt show hero in that suit he played a military diver (attaching mines to ships etc.) long before such divers existed. This special corps used an early oxygen rebreather scuba set, the Auto Respiratore ad Ossigeno (A.R.O), a development of the Dräger oxygen self-contained breathing apparatus designed for the mining industry and of the Davis Submerged Escape Apparatus made by Siebe, Gorman & Co and by Bergomi, designed for escaping from sunken submarines. This was used from about 1920 for spearfishing by Italian sport divers, modified and adapted by the Italian navy engineers for safe underwater use and built by Pirelli and SALVAS from about 1933, and so became a precursor of the modern diving rebreather. For this new way of underwater diving, the Italian frogmen trained in La Spezia, Liguria, using the newly available Genoese free diving spearfishing equipment; diving mask, snorkel, swimfins, and rubber dry suit, the first specially made diving watch (the luminescent Panerai), and the new A.R.O. scuba unit. This was a revolutionary alternative way to dive, and the start of the transition from the usual heavy underwater diving equipment of the hard hat divers which had been in general use since the 18th century, to self-contained divers, free of being tethered by an air line and rope connection. After Italy declared war, the Decima Flottiglia MAS (Xª MAS) attempted several attacks on British naval bases in the Mediterranean between June 1940 and July 1941, but none were successful, because of equipment failure or early detection by British forces. On September 10, 1941, eight Xª MAS frogmen were inserted by submarine close to the British harbour at Gibraltar, where using human torpedoes to penetrate the defences, sank three merchant ships with limpet mines before escaping through neutral Spain. An even more successful attack, the Raid on Alexandria, was mounted on 19 December on the harbour at Alexandria, again using human torpedoes. The raid resulted in disabling the battleships HMS Queen Elizabeth and HMS Valiant together with a destroyer and an oil tanker, but all six frogmen were captured. The British Royal Navy had captured an Italian human torpedo during a failed attack on Malta; they developed a copy called the Chariot and formed a unit called the Experimental Submarine Flotilla, which later merged with the Special Boat Service. A number of Chariot operations were attempted, most notably Operation Title in October 1942, an attack on the German battleship Tirpitz, which had to be abandoned when a storm hit the fishing boat which was towing the Chariots into position. The last and most successful British operation resulted in sinking two liners in Phuket harbour in Thailand in October 1944. Royal Navy divers did not use fins until December 1942. In 1933 Italian companies were already producing underwater oxygen rebreathers, but the first scuba diving set is generally recognised inside the USA as being invented in 1939 by Christian Lambertsen, who dubbed it the Lambertsen Amphibious Respirator Unit (LARU). and patented it in 1940. He later renamed it the Self Contained Underwater Breathing Apparatus, which, contracted to SCUBA, eventually became the generic term for both open circuit and rebreather autonomous underwater breathing equipment. Lambertson demonstrated it to the Office of Strategic Services (OSS) (after already being rejected by the U.S. Navy) in a pool at a hotel in Washington D.C. OSS not only bought into the concept, they hired Dr. Lambertsen to lead the program and build-up the dive element of their maritime unit. The OSS was the predecessor of the Central Intelligence Agency and the maritime element still exists inside their Special Activities Division. John Spence, an enlisted member of the U.S. Navy, was the first man selected to join the OSS group. In an interview with historian Erick Simmel, Spence claimed that the name "frogman" was coined while he was training in a green waterproof suit, "Someone saw me surfacing one day and yelled out, 'Hey, frogman!' The name stuck for all of us." The Shayetet 13 commandos of the Israeli Navy have carried out a number of underwater raids on harbors. They were initially trained by veterans of Xª MAS and used Italian equipment. As part of Operation Raviv in 1969, eight frogmen used two human torpedoes to enter Ras Sadat naval base near Suez, where they destroyed two motor torpedo boats with mines. During the 1982 Falklands War, the Argentinian Naval Intelligence Service planned an attack on British warships at Gibraltar. Code named Operation Algeciras, three frogmen, recruited from a former anti-government insurgent group, were to plant mines on the ships' hulls. The operation was abandoned when the divers were arrested by Spanish police and deported. In 1985, the French nuclear weapons tests at Moruroa in the Pacific Ocean was being contested by environmental protesters led by the Greenpeace campaign ship, Rainbow Warrior. The Action Division of the French Directorate-General for External Security devised a plan to sink the Rainbow Warrior while it was berthed in harbor at Auckland in New Zealand. Two divers from the Division posed as tourists and attached two limpet mines to the ship's hull; the resulting explosion sank the ship and killed a Netherlands citizen on board. Two agents from the team, but not the divers, were arrested by the New Zealand Police and later convicted of manslaughter. The French government finally admitted responsibility two months later. In 1989, during the U.S. invasion of Panama, a team of four U.S. Navy SEALs using rebreathers conducted a combat swimmer attack on the Presidente Porras, a gunboat and yacht belonging to Manuel Noriega. The commandos attached explosives to the vessel as it was tied to a pier in the Panama Canal, escaping only after being attacked with grenades. Three years later during Operation Restore Hope, members of SEAL Team One swam to shore in Somalia to measure beach composition, water depth, and shore gradient ahead of a Marine landing. The mission resulted in several of the SEALs becoming ill as Somalia's waters were contaminated with raw sewage. A French frogman with chest counterlung loop rebreather with two breathing tubes (model "Oxygers", 1957). Italian World War II frogman of "Gruppo Gamma"
USMC 2nd Reconnaissance Battalion refreshing in combatant diving with the Draeger LAR V rebreather. Mannequin wearing Finnish Navy combat diver equipment. The chest rebreather is likely a Viper S-10. Diver lock for frogmen on a type XXI U-boat. US Navy SDV MK IX Swimmer Delivery Vehicle. Non-watertight submersible held two scuba-equipped swimmers. A member of SEAL Delivery Vehicle Team Two prepares to launch one of the team's SEAL Delivery Vehicles from the back of the USS Philadelphia on a training exercise. The SDVs are used to carry Navy SEALs from a submerged submarine to enemy targets while staying underwater and undetected. For errors about frogmen and scuba diving found in public media, see Underwater diving in popular culture#Errors about frogmen found in public media. ^ a b c Perry, Tony (2013-11-03). "John Spence dies at 95; Navy diver and pioneering WWII 'frogman'". Los Angeles Times. Retrieved 2013-11-27. ^ Staff. "Frogman". Dictionary. Merriam Webster. Retrieved 13 March 2017. ^ Staff. "Frogman". Oxford Living Dictionaries. Oxford University Press. Retrieved 13 March 2017. ^ Angus Stevenson, ed. (2010). Oxford Dictionary of English. Oxford, UK. : Oxford University Press. p. 702. ISBN 9780199571123. ^ Staff (23 August 2007). "Frogman (Naval personnel)". Britannica online. Encyclopaedia Britannica. Retrieved 13 March 2017. ^ Staff. "Frogman". Cambridge Dictionary. Cambridge University Press. Retrieved 13 March 2017. ^ Staff. "Frogman". Macmillan Dictionary. Macmillan Publishers Limited. Retrieved 13 March 2017. ^ Staff. "Frogman". Collins English Dictionary. HarperCollins Publishers. Retrieved 13 March 2017. ^ Kipfer, Barbara Ann; Chapman, Robert L. (2007). The Dictionary of American Slang (Fourth ed.). HarperCollins Publishers. ^ US Navy (2006). "19". US Navy Diving Manual, 6th revision. United States: US Naval Sea Systems Command. p. 13. Retrieved 2008-06-15. "Just then as divers are sometimes provided with instruments for respiration, through which they can draw air from above the water, and thus may remain for a long time under the sea, so also have elephants been furnished by nature with their lengthened nostril, and, whenever they have to traverse the water, they lift this up above the surface and breathe through it." ^ Thukydides, History of the Peloponnesian War, edition Ambrosio Firmin Didot, Paris, 1842, book 4, 26, and b. 7, 25. In Greek and Latin. ^ Pierros D. Nick, The tactics of the enemies in the sea warfare during the Peloponnesian War. 1st Pan-Corinthian Congress, Corinth, Greece, 2008. In Greek. N. Pierros is a Civil Engineer and author of historical essays. ^ "History - Rebreathers Diving Center,". ^ Marí, Alejandro Sergio. "Pirelli ARO WW II". Therebreathersite.nl (Janwillem Bech). ^ "Rebreathers - Rebreather Autorespiratori per l'Immersione Subacquea a recupero di gas". Archived from the original on 2012-07-10. ^ O'Hara, Vincent P.; Cernuschi, Enrico. "Frogmen against a fleet: The Italian Attack on Alexandria 18/19 December 1941". www.usnwc.edu. Naval War College Review. Archived from the original on 12 February 2017. Retrieved 19 September 2016. ^ "Information sheet no 101 - Attack on the Tirpitz" (PDF). www.nmrn-portsmouth.org.uk. National Museum of the Royal Navy. 2014. Retrieved 26 September 2016. ^ Hood, Jean, ed. (2007). Submarine. Conway Maritime. pp. 505–506. ISBN 978-1-84486-090-6. ^ Shapiro, T Rees (18 February 2011). "Christian J. Lambertsen, OSS officer who created early scuba device, dies at 93". Washington Post. Retrieved 16 May 2011. ^ a b Shapiro, T. Rees (2011-02-19). "Christian J. Lambertsen, OSS officer who created early scuba device, dies at 93". The Washington Post. ^ "CIA Special Operations Group - Special Activities Division". ^ Isseroff, Ami (2005). "Zionism and Israel - Encyclopedic Dictionary - Shayetet 13". www.zionism-israel.com. Retrieved 12 March 2017. ^ Gawrych, George Walter (2000). The Albatross of Decisive Victory: War and Policy Between Egypt and Israel in the 1967 and 1973 Arab-Israeli Wars. Praeger. p. 111. ISBN 978-0313313028. ^ "Operation Algeciras: How Argentina planned to attack Gibraltar". newhistories.group.shef.ac.uk. New Histories. 21 May 2011. Retrieved 12 March 2017. ^ REPORTS OF INTERNATIONAL ARBITRAL AWARDS : Case concerning the differences between New Zealand and France arising from the Rainbow Warrior affair (PDF). United Nations. 6 July 1986. p. 200. Retrieved 12 March 2017. ^ Edwin P. Hoyt (15 June 2011). SEALs at War. Random House Publishing Group. pp. 159–. ISBN 978-0-307-57006-2. ^ Don Mann (5 August 2014). How to Become a Navy SEAL: Everything You Need to Know to Become a Member of the US Navy's Elite Force. Skyhorse Publishing. pp. 18–. ISBN 978-1-62873-487-4. Bush, Elizabeth Kauffman. America's first frogman : the Draper Kauffman story. Naval Institute Press. ISBN 1-59114-098-6. OCLC 55699399. Fraser, Ian (1957). Frogman V.C. Angus & Robertson. OCLC 1599838. Pugh, Marshal (1956). Frogman: Commander Crabb's story. OCLC 1280137. Welham, Michael G.; Welham, Jacqui (1990). Frogman Spy: the mysterious disappearance of Commander 'Buster' Crabb. W.H. Allen. ISBN 1-85227-138-8. OCLC 21979335. Tony Groom: DIVER. Royal Naval Clearance Divers work in the Falklands conflict. ISBN 978-1574092691.